Admit it: you look at your phone when you’re on the toilet. It’s okay, you’re not alone, but you know what might make that experience even better? Some apps to customize your pooping experience. iFart and Places I’ve Pooped have this market cornered. All you have to type into the search window in the App Store is “Places” or “iF” and the iPhone will auto fill the rest for you. See? I told you you’re not alone. the exact same place. The app has over 1.2 million Apple users alone, and has recently been the top entertainment app for both Android and iPhone users. Places I’ve Pooped gives you the chance to make friends in a whole new way. When you share the place that you’ve emptied yourself, people can follow you like any other social media website. If that gets too boring for you then why don’t you just record, share, and name your own farts? Yep, you can do that too. 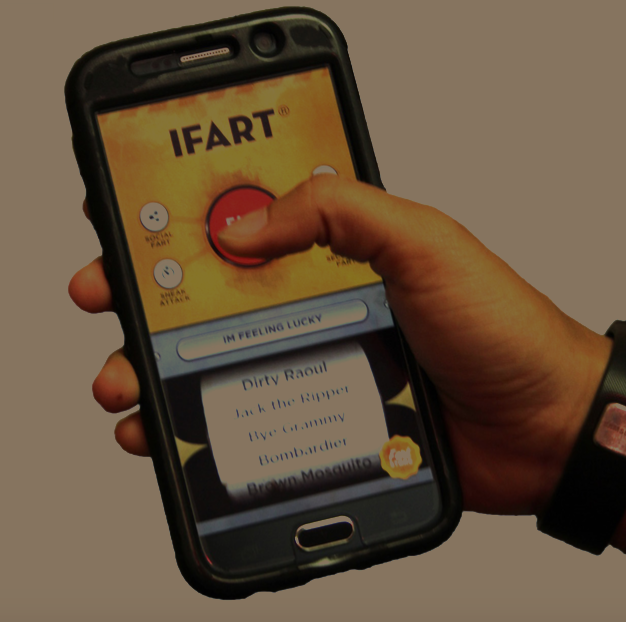 The iFart also comes with different categories that allow users to take advantage of varieties of farts, including one with song remixes that are of course renamed to succumb to farts—and that is not the end. Other categories are movies, shark toppers, presidential farts, Fart Wars, bands, food, and celebrities. The six current categories for the iFart app are Security Fart, I’m Feeling Lucky, Sneak Attack, Record-A-Fart, Fart Now, and even Social Fart. The Social Fart category allows users to share farts with each other via either the app itself or by other social media platforms like Facebook or Instagram. “The fact that there are apps out there that aren’t serious in at all and are the stupidest things possible, is what makes it so appealing,” Saunders said. Both iFart and Places I’ve Pooped have five stars on the App Store rating charts and their continued rise could indeed prove to be fun for people above the age of nine, which is the minimum age limits for these apps. iFart hit number one on the iTunes app store entertainment category in 2008 and has been an all-time Top 20 app since, with features appearing on The Daily Show with Jon Stewart, The Today Show, The Wall Street Journal, New York Times, MSNBC.com, along with dozens of other organizations and news networks. Even if you don’t care about making friends in smelly atmospheres, the security feature may change your mind. Caron’s favorite, ‘security mode’, allows him to enter whatever fart the app has to offer and set it as a security setting so that whenever anyone picks up his phone, the phone will sense that someone is moving it and they will get a nasty alarm. “It is a really funny way of either securing your phone or just playing pranks on people,” Caron said.